Reprint. Originally published: London: Headline, 2016. 'This is not just the most insightful book ever written on public speaking-it's also a brilliant, profound look at how to communicate' - Adam Grant, author of ORIGINALSIn Ted Talks Chris Anderson, Head of TED, reveals the inside secrets of how to give a first-class presentation. 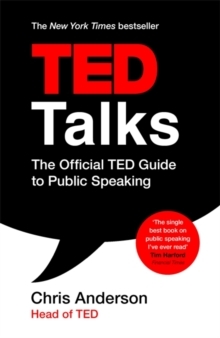 Where books like Talk Like TED and TED Talks Storytelling whetted the appetite, here is the official TED guide to public speaking from the man who put TED talks on the world's stage. 'Nobody in the world better understands the art and science of public speaking than Chris Anderson. He is absolutely the best person to have written this book' Elizabeth Gilbert. Anderson shares his five key techniques to presentation success: Connection, Narration, Explanation, Persuasion and Revelation (plus the three to avoid). He also answers the most frequently asked questions about giving a talk, from 'What should I wear?' to 'How do I handle my nerves?'. Ted Talks is also full of presentation tips from such TED notable speakers as Sir Ken Robinson, Bill Gates, Mary Roach, Amy Cuddy, Elizabeth Gilbert, Dan Gilbert, Amanda Palmer, Matt Ridley and many more. This is a lively, fun read with great practical application from the man who knows what goes into a truly memorable speech. In Ted Talks Anderson pulls back the TED curtain for anyone who wants to learn how to prepare an exceptional presentation.